I couldn't get a good photo of black Zorro this morning. So I took a bad photo, played with Elements, found "posterize" and this is what I got. I then added color to each image and stitched them together in ImageWell. My last portrait is here. It is also of Zorro. I have the required five subjects. Below are the portraits of Charlie that I will submit. 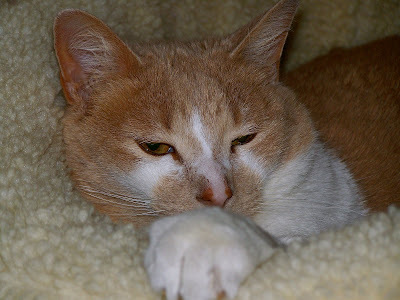 I got lousy photos of Turnip and Pansy but will not submit them. I have been so busy with the photos, reading assignments, two jobs, a hair appointment and the weather that I have not had time to visit your blogs or respond to your wonderful comments. Please forgive me and be patient. I still have to write a paper for tomorrow night's class. The topic: the Vermont photos of Lewis Hine. Hine began photographing child labor in 1908. The photos were influential in changing child labor laws in this country. His work is featured in the book Counting on Grace by Elizabeth Winthrop. February 1910. 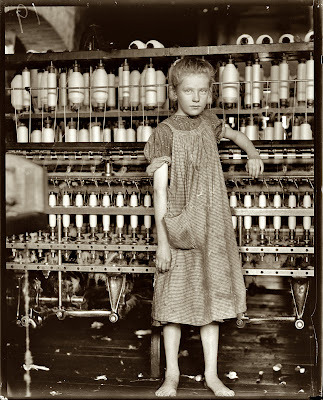 Addie Card, 12 years old, anemic little spinner in North Pownal Cotton Mill, Vermont. Girls in mill say she is ten years. She admitted to me she was twelve; that she started during school vacation and would "stay." Photograph and caption by Lewis Wickes Hine. Commenter Joe Manning adds: "this was the first Hine photo I researched for my Lewis Hine Project. Addie lived to be 94 years old. See the whole story of my research at www.morningsonmaplestreet.com/addiesearch1.html." I recommend that you visit the site. Cool. I like the posterized photos - I've done some experiments with that myself. 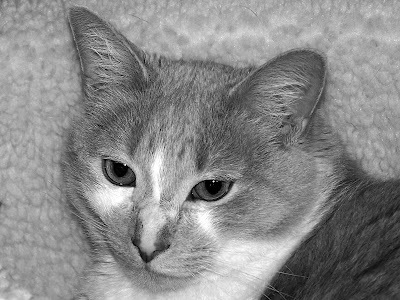 The straight portraits are great as well - cats do photograph well, don't they? Thank you, Mr. Manning, for correcting me. I am thrilled that the site is up! She is a beautiful girl and the photograph is awesome. I can't express to you my excitement at visiting your site! I'll bet that photo class is very enjoyable. The Addie Card story was really interesting and the photograph was amazing. Your bluebird photos, especially the first one, are beautiful!